I eat a lot of bacon. Real bacon, not the stringy little packaged kind. The thick cut, meaty, smokey delicious kind. So much so that the guy at the meat counter recognizes me as the bacon girl. On Monday night I order 2 lbs of it. I came back in on Wednesday to grab some chicken and he asked if I was back for more bacon. I jokingly told me I still had a 1/2 lb left and he believed me. I’ve probably eaten that much in 48 hours before. I used to shun bacon like the evil fatty devil I thought it was, so I think I’m just making up for 26 years of deprivation. 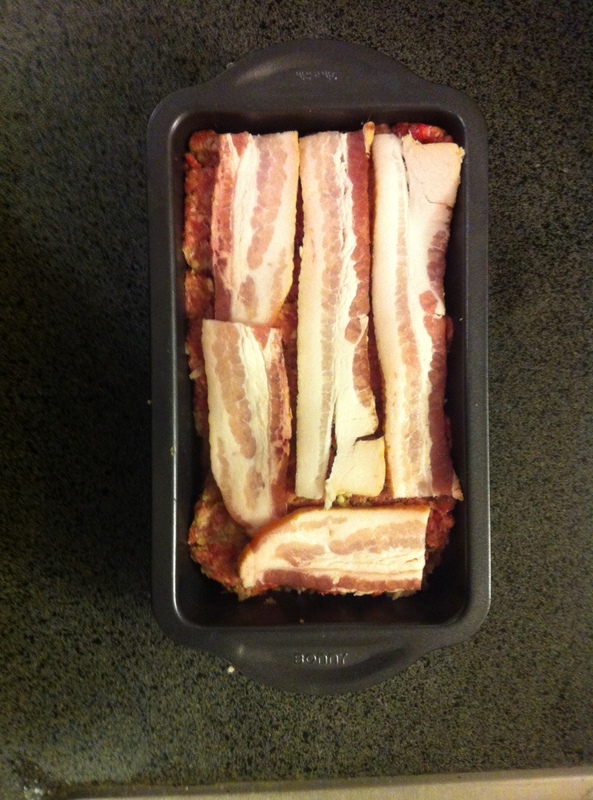 Last week I was growing PaleoOmg for now recipes and stumbled across a bacon meatloaf recipe. I started salivating like Pavlov’s dog and I knew I had to make it right away. I spent an hour I had between classes getting the ingredients and prepping it so all I had to do when I got home was pop it in the oven. I give to you Paleo Bacon Meatlof. I literally forgot to take a picture after it was cooked because I was too excited to try it, so you are stuck with the precooked version. Imagine that just crispier. If you’re a vegetarian/vegan (Hi Liz) I am not quite sure why you click on a link called Bacon Meatloaf, but you might want to stop here. Dice up your 2 pieces of bacon and throw in a frying pan to cook up for about 5-7 minutes. While the bacon is cooking, mix together all other ingredients (except for your 9 slices of bacon) in a large bowl. Once your 2 pieces of bacon are done cooking, add them to the bowl and fully incorporate into the mix. If you are me, now layer the remaining bacon and meat mixture in a meatloaf/bread pan so that you have meat/bacon/meat/bacon. Or, just do it the way Paleoomg says and put the bacon on top. But that is less fun. Add the garlic and stir together to cook a bit more. Add all other ingredients and mix together, then let simmer for 10-15 minutes (or longer if you have time-I usually want to eat as quick as possible). Now sit around and wait hungrily for the meat loaf to be done so you can pour the sauce on top and get to nomming. What are your favorite ways to eat bacon? This entry was posted in Uncategorized and tagged clean eating, CrossFit, diet, Healthy, Paleo, Recipe by fionaboger. Bookmark the permalink. This looks amazing. Another must try! I love bacon but I hate cooking it because all the greasy mess. I love it on BLT’s or with my breakfast. This meatloaf looks amazing! WOW! I have to try this one!